The Capitals have been making moves recently to bolster their prospect depth. Part of this plan is Yale University forward Joe Snively, who just last month signed a two-year entry level contract with Washington as an undrafted college free agent. A native of Herndon, Virginia, the chance to sign with the team he grew up watching and supporting was a dream come true for 23-year old Snively. Snively began his journey in professional hockey in 2012 at the age of 16, being drafted at 57th overall by the Sioux City Musketeers in the USHL Futures Draft after playing Under 16’s with Selects Hockey Academy. Across his three seasons in the United States Hockey League, Snively recorded impressive numbers in his 159 games for the Musketeers, accumulating 50 goals and 125 points in total. His 2014-15 season was a standout as Snively went on to post 27 goals, 37 assists and a total of 64 points which led him to collegiate hockey. He commenced with Yale University for the 2015-16 season and his consistent totals continued. Snively was awarded four honours during his Freshman Season at Yale including being named to the NCAA All Rookie Team and All Ivy League Honourable Mention Team. To cap off a strong rookie season, Snively was also awarded the NCAA (ECAC) Rookie of the Year and NCAA Ivy League Rookie of the Year which put him on the College hockey map. Known for his accuracy and quick shot, Snively recorded three more successful seasons for Yale and picked up numerous honours along the way. In 2017-18, a season in which he posted 36 points in 31 games for Yale, he was named to the NCAA All Ivy League First Team and followed that up by gaining a spot in the NCAA First All Star Team this season. Reports stated that as Snively’s NCAA season came to a close, more than 20 NHL teams expressed interest in the small forward. According to Snively, he spoke to 5 and selected his home town Capitals who signed him in mid March 2019. 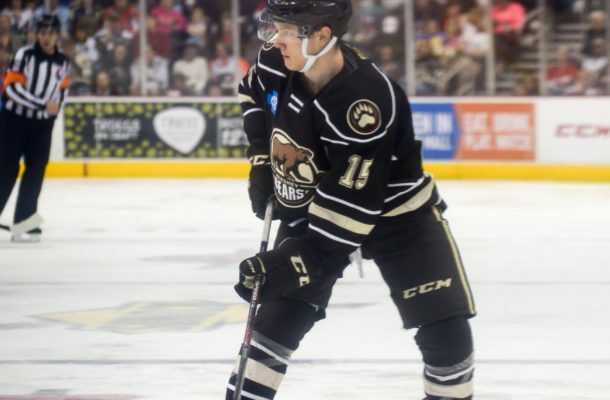 Snively has since been allocated to the Hershey Bears and has played 7 games in Hershey so far, as they move towards the imminent Calder Cup Playoffs. There is plenty of work still to be done for the quick skating forward before his NHL debut will come calling (which includes finishing his Senior Year at Yale) but the hard skating and dedicated Snively will no doubt provide the Capitals with a boost to their much needed prospect stocks from next season onwards.